Be the first to share your favorite memory, photo or story of Hannah. This memorial page is dedicated for family, friends and future generations to celebrate the life of their loved one. Hannah Joyce Isom, 57, of Evansville, Indiana died at 5:00 a.m., Tuesday, March 26, 2019 at her home. Funeral services and burial will be private. Public visitation will be from 4:00 p.m. until 7:00 p.m. on Friday, March 29, 2019 at Hughart, Beard & Giles Funeral Home. Hughart, Beard & Giles Funeral Home is in charge of arrangements. A native of Fort Campbell, Kentucky she was born on November 4, 1961 the daughter of Reed Von Isom and Joyce Daniel Isom. 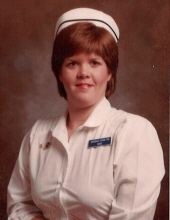 She was a registered nurse at Deaconess Hospital in Evansville, Indiana where she retired after over 20 years of service. She also taught nursing at Southern Indiana University and Ivy Tech in Evansville. She received her BSN from Austin Peay State University in Clarksville, TN and her MSN from the University of Evansville. Survivors include her mother: Joyce Daniel Isom of Hopkinsville, KY; her brothers, Timothy (Denise) Isom of Bowling Green, KY and Samuel Isom of Hopkinsville, KY; her nieces and nephews, Alecia Underwood, Sarah McCord and Donald Isom. She was also survived by her lifelong friend, Teri Clark of Newburgh, IN. Memorials may take the form of donations to St. Jude Children’s Hospital or a pug rescue or no kill animal shelter of your choice. To plant a tree in memory of Hannah Joyce Isom, please visit our Tribute Store. "Email Address" would like to share the life celebration of Hannah Joyce Isom. Click on the "link" to go to share a favorite memory or leave a condolence message for the family.